One of Sir Martin’s most important and final acts in the preparation of a book for publication was the creating of the Index. It was an opportunity to have a final read-through of the galley or proof copy, make final corrections, and build an Index. Anytime he came across a name or a place or a particular event he felt was noteworthy, it would be transcribed onto its own separate index card along with the page number, and in that way the index entries were noted on their cards and the page numbers built up. 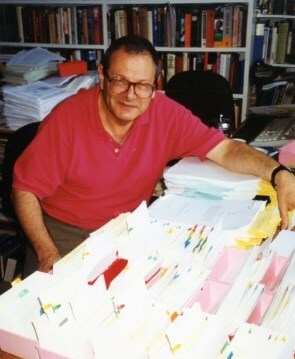 The photo shows Sir Martin with one of his indexes, the cards in many boxes in front of him. When Final Journey, his first book on the Holocaust came out, Sir Martin was criticised for using survivor testimony. But he knew from having met so many of those who knew and worked with Winston Churchill that eye-witness accounts give texture and depth to an event. Luckily for his readers he persevered, and his Indexes point to those names, places and events. Genealogists, geographical and historical researchers are in his debt for his careful listings that shine a light into the text. Thanks to RosettaBooks and Sir Martin’s other ebook publishers, the Indexes are available here as pdfs, and searchable with a Find & Replace or Search For click. To search for a particular name or place, each book’s Index must be searched individually. A successful search will show on what page or pages the entry can be found in the book. A link to the book will help the researcher to find more information on the book. If a successful search, or interest piqued, more information on the book can be found by following the link to that book. Successful searches will be posted so Please send an email to info@martingilbert.com with that information. Click on the title to go directly to book page. Click on index below to go directly to the index. Please note that large indexes will take a little longer to upload.